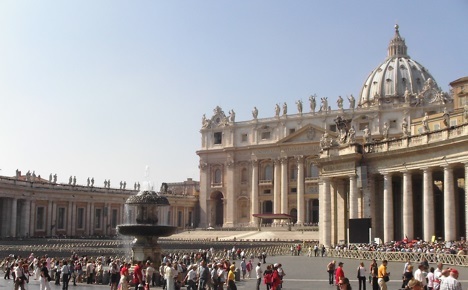 Welcome to Travel Guide 2 Italy, the site about travel, tourism and vacations in Italy. Italy (Italian: Italia), officially known as the Italian Republic (Italian: Repubblica Italiana) is a country in southern Europe. The majority of the country is located on the Italian peninsula, but the country also includes the two largest islands in the Mediterranean (Sicily and Sardinia) as well as many smaller islands, and a small enclave in (Campione d'Italia) within the Canton of Ticino in Switzerland. Contained as enclaves within Italy are two independent sovereign states (San Marino and Vatican City), and the country has land borders with Austria, France, Slovenia and Switzerland. As of 2006, Italy had an estimated population of 59,131,287. Currently the country's population is experiencing slow growth because of longer life expectancies and immigration. However, Italy has a very low birth rate, and the population is rapidly aging - if this trend continues, by 2050, the population could fall by a quarter. 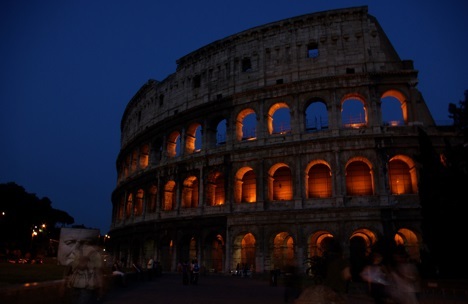 Italy's capital and largest city is Rome which has a population of 2.7 million. The cities of Milan and Naples also have populations of over a million (1.3 million and 1 million respectively), and are both situation within large and heavily populated metropolitan areas. 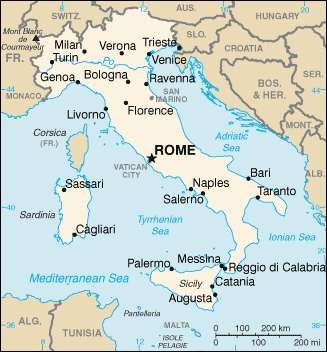 Other important cities in Italy include Bari, Bologna, Catania, Florence, Genoa, Palermo and Turin. Italy has a highly developed economy, the 7th largest in the world, and 4th largest in in Europe as of 2006. The northern parts of the country are home to a modern industrial sector, which has made Italy one of the world's leading exporters of manufactured goods. Southern parts of the country are generally less developed and more orientated towards agriculture. It should also be noted that Italy also has an unusually large "underground" economic sector, which is not included in the offical figures and many account for as much as a sixth of the GDP. Tourism is also an important industry in Italy, and the country is visited by 37 million tourists each year, making it the 5th most popular tourist destination in the world. Italy is a member of the European Union, and also joined the eurozone from when the currency was first introduced in 1999. Euro membership requirements have demanded relatively stringent financial policies for the past decade, but the country has benefited from the resulting low inflation and low interest rates.